New Paltz is a special place. It is still surrounded by magnificent nature. Residents and guests can enjoy hiking, climbing, biking, swimming, and simply being outside. In New Paltz, there are plenty of pedestrian sidewalks, good and bad restaurants, noisy bars, stores with healthy foods, various yoga studios, and even some wild frolicking places. It is all really wonderful, greatly enjoyable, and allows one to keep his or her private space at all times. The actual private space-breaking, human touch or shoulder rubbing, occurs less and less in our society, mostly in dark places and, as a rule, after a good number of drinks. Although throughout most of human existence and development, over two million years, our clawless and vulnerable ancestors developed and survived staying constantly, and literally, in close touch with each other. Albeit many wants and needs are satisfied and over satisfied in New Paltz, yet the need for human closeness and direct non-verbal communication is often neglected. 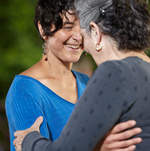 This is why we decided to find a place and to start teaching tango in New Paltz. Tango is about stepping into each other´s space. Humans do need to step into each other´s space and welcome another into their space to feel in touch and together, to achieve solidarity and harmony, and ultimately to be happy. Be happy in New Paltz, in touch with nature and each other!